Shirts are almost synonymous with men’s apparel and today there are a slew of brands that are tapping into this market and offering shirts for all reasons and seasons. And yes, these brands have shirts for numerous occasions as well. So here we give you a low down on what some shirt brands are doing to make the shirt experience different. Established in 1990, Officer Shirts have come a long way to become one of the leading manufacturers of men’s clothing and shirts. The company is currently focuses on the mid market segment for shirts in the range Rs. 695 – Rs. 1295. “The reason of our progressive growth is ethical business principles dedication towards work and passion for excellence. We constantly work towards ensure we give our customers value for money products. We believe that through constant development and design we can create products which will give us an added advantage over our competitors. We have always valued the importance of creating value added fashion garments which gives us an edge,” says Asif Memon, Director. The company has a pan India presence across 2000 multi brand outlets (MBO’s) and believes that its trusted dealers have worked effectively with them. Apart from shirts, the product range also includes formal trousers sub brands like casual shirts called Cotton Fever and Denims under the sub brand Outlook Fashion. All the fabrics are sourced directly from the mills and the shirts are manufactured using a wide range of fabrics including all kinds cotton, mixed linens and linen blends among others. The major new launches happen twice a year in summers and winters. However there are close to four new collections that are actually released via updated collections every year. “What makes the difference is the trust factor, quality, value for money and a lot of experience that has gone in that makes the difference. Also we have an edge as far as pricing is concerned as our shirts are easily Rs. 200 – Rs. 300 lesser than other brands. Also we do our own manufacturing and stitching in house and supply chain and delivery is all managed well,” adds Asif. The brand is looking to have 5000 MBO’s over the next couple of years and also consolidate market presence through agents and distribution channels in Chattisgarh, Bihar and Bengal. They are also looking at expanding through the online route. Matchles offers innumerable number of solutions in the men’s clothing range. If you are bored of wearing the same design and patterns of shirts, pants, pathani’s, kurta’s and the like this is where your search ends. Matchles offers unique patterns which are uncommon with its vast variety of designs and patterns that offer a whole range of choices. 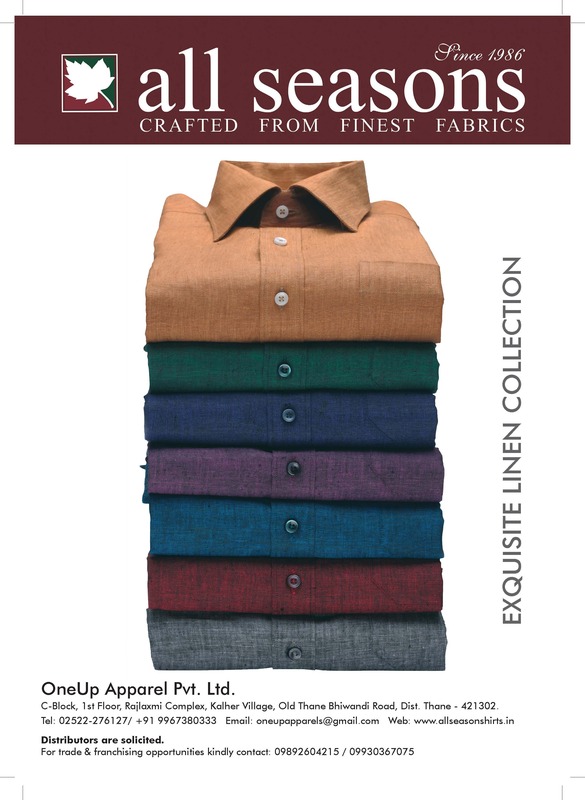 According to Nehul Vora, the proprietor of this brand, “basically we are manufacturing shirts from the last 13 years and since the last 8-9 years we are using only pure linen fabrics to manufacture our shirts. In fact we are a pioneer in linen fashion shirts and we have started giving tailor made fit to customers. In fact the fit of our shirts is a major unique selling proposition also. What sets our shirts apart is their quality and crafting that makes us matchless as compared to other brands. We are always trying to give best of product and services to customers and can today say that we have good customers across India.” Looking ahead the company wants to focus on more premium products in future. 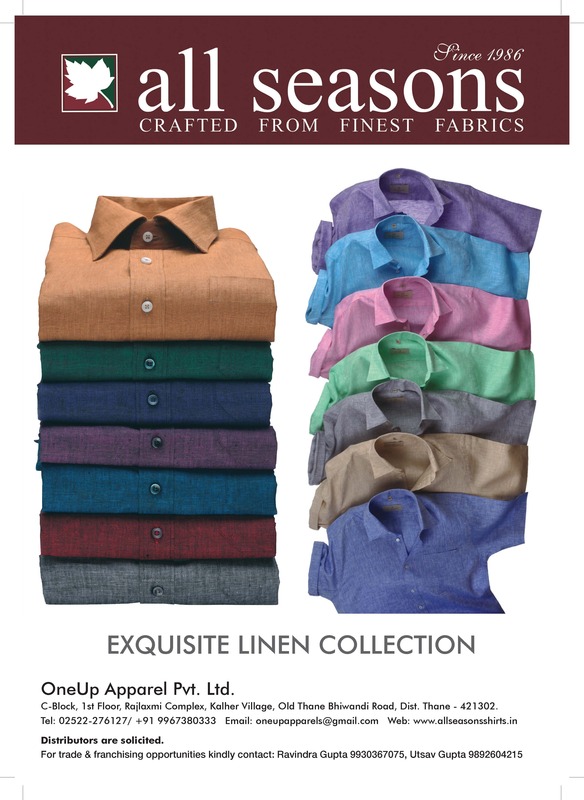 Established in 1996, Aditya Shirts Pvt. 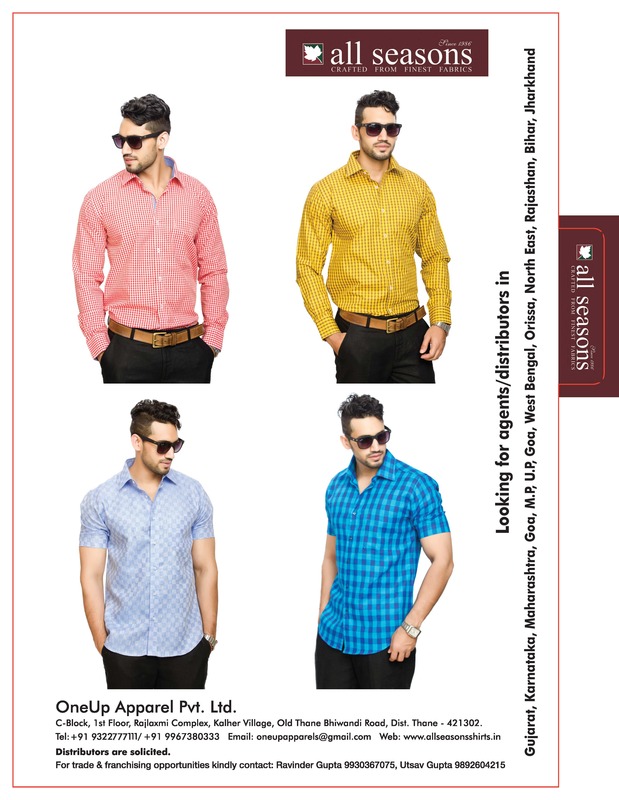 Ltd. manufactures and supplies quality-approved range of Formal Men Shirts, Casual Men Shirts and Party Wear Men Shirts. This has earned the company widely acclaimed clients across the nation for their superior shirt quality. The product range includess Mens Formal Shirts, Men Trendy Shirt, Men Formal Trendy Shirts, White Casual Men Shirts, Stylish Casual Men Shirts, Mens Casual Check Shirts, Casual Shirt, Party Wear Striped Shirts, Party Wear Men Shirts, Party Wear Designer Men Shirts and Party Wear Shirts. The timely delivery of consignments and ethical business policies of the organization helps us in establishing huge client base across markets. Gopikanth. L. Choudhary, owner says, “owing to the superior quality of the product range offered, we have carved a firm foothold in the domain. The products offered by us are in compliance with industrial standards and are offered at most affordable prices. The professionals appointed by us invest their long working hours in manufacturing products as per client specifications and details to meet their exact requirements.” Timely delivery, quality-proven range, wide distribution network, vast industrial experience and plethora of customisation options make the difference for his brand. They manufacture shirts under the brands Collars and Ciara. Established in 1987 with a commitment to give “quality at value for money” the group has labels straddling across various price-segments and occasions. The group has three brands in the menswear space namely John Noble, 1-Up and JN-Sports which currently enjoy a pan India presence and a rapidly expanding fan base among the fashion conscious Indian male consumers. The group also has an impressive manufacturing infrastructure base that not only caters to the groups brands but also extends its expertise and capabilities to private brands of large Indian retailers, thus partnering them as their manufacturing partner. The brand caters to various categories of menswear based on the occasion-to-wear, namely formals, semi-formals and casuals in both trousers and shirts. Committed to bring the latest in global fashion trends, the brand focuses on providing quality fabrics with an impeccable finish and eye for detailing. The seasonal collections have always been blends of unique fashion tastes of India’s masses along with the global trends forecasted in the fashion capitals of the world. “John Noble is a menswear fashion brand born two decades ago to cater the fashion conscious and upwardly mobile fashion connoisseur who yearns for a fashion label that he can flaunt but is equally value conscious, the brands unique positioning of being “Surprisingly Indian” defines the brand promise to be a fashion forward western menswear with value for money being the important aspect of the brand. We are committed to bring the latest fashion trends, the brand focuses on providing quality fabrics with impeccable finish and eye for detailing,” says Hemant Gogri, Partner, 1-UP Clothing Co. The brand enjoys a pan India presence along-with formidable presence in exports to Middle East, Africa and more. The brand represents itself with various categories of menswear based on the occasion-to-wear, namely formals, semi-formals and casuals in both trousers and shirts. The brand has impressive manufacturing infrastructure units with the state of art facility. The brand has recently also introduced a casual wear menswear brand “JN Sports” being a sister concern brand of john noble. These fashion products are meant to impress and a promise not to cut your conscience to fit today’s fashion and being positioned as authentic casuals. Impeccable quality, contemporary styling and unmatched finish is a hallmark of John Noble formalwear. They also have a youthful collection for the sporty and fun-loving with floral prints, duo toned styling and bold bands. 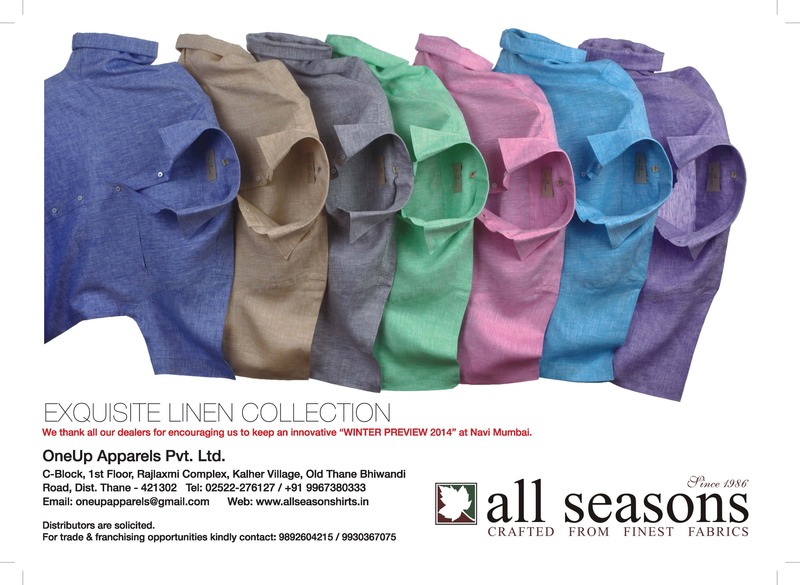 All Seasons established in 1986 has created a niche in terms of linens and premium formal shirts and also provide Giza cotton shirts, exclusive printed shirts and kurtas for men. All seasons is popularly known for its fabric, fit and comfort. According to Utsav Gupta, owner, “we update the collection with new fabrics and create new designs every season while making sure that the shirts are made and checked with precision before it is sold. It is of utmost importance for our brand to match the taste of our customers and hence we make sure that our shirts are made with concise precision. What we do differently is that we source the fabric from various vendors in the market. These are the best in their own field and we ensure that we choose fabrics that are the best in the industry. Even when we started 30 years before our mindset was always to create the best shirts using the best fabrics available in the market. The company works extensively with linen that has its own nature that makes it as distinctive as versatile. For the uninitiated, linen is stronger than cotton and also softens with every wash. “We use yarns that are best in quality and use two-ply mercerized cottons, mono cottons and flex cottons to ensure that the feel and fall of the shirt is unmatched.” In fact what sets these shirts apart is that the fabrics used to make them cost way above Rs. 1000 per meter and are only available in special fabric departments. In fact the best quality shirts has been the company’s niche for the last three decades and their customers cannot feel the same appeal from any other garment. “We do not follow what other brands do and we ensure that all minute details are taken care of. Likewise we also use a lot of digital prints and come up with a new range once in 2-3 months. In fact we have collections for four seasons – spring summer autumn and winter. We also do special collections for Diwali and New Year. Even though our preview is twice a year, keep maintain the range almost every month. Our range and variety is vast and what sets us apart is that we have above 1000 designs in linens which is unique. We have 400 different colours in solids and also have both artificial and pure silk shirts in over 100 colours. We also use jacquards along with prints for a wider range in terms of choice. We are currently focusing on collars like mandarin collars, semi cutaway and Wembley collars. This season is all about experimenting with collars and we are not changing the fit and will focus on slim fits. Also very season sees a few designer wear shirts.” The company maintains designs in 70 and 80 LEEs (the latter costs Rs. 2999-Rs.3599) and they have launched a special edition white shirt using 150 LEE at Rs 6199 which has got a good response in the market. The company hopes to expand through franchise opportunities, Shop in Shop ventures with Large Franchise Store, Exports and widening their distribution network. This appeared in the June 2016 issue of Apparel magazine: Apparel – June 2016 – Category Profile – The Shirt Saga!